An artfest, inspired by Jonah Schwarz-Mullins, took place at Jewish Family Service Food Pantry last summer, raising more than $6,000 to support the organization’s new truck. On the road again, Jewish Family Service is on the road again, again and again. Its new, 26-foot refrigerated food pantry truck is making the rounds three times a week, collecting boxes and pallets of food from throughout the Metroplex. “The truck is an absolute game-changer. We had offers from many stores to provide us with food but we just didn’t have a way to get it here,” said Cathy Barker, JFS’ CEO. Barker noted that previously, it was up to volunteers and employees to pick up donations. As a result, time and vehicle space constraints limited significant intake. “Now, we’re regularly collecting pallets of food, of produce that requires refrigeration, and all kinds of goods; that allows us to distribute it to the many who need it,” she said. JFS’ Food Pantry, an affiliate of the North Texas Food Bank, provides food for nearly 60 qualifying families a day who have cleared the intake process for support — close to 4,500 individuals, in 20 ZIP codes. Clients come to the food pantry to shop, as they might at a grocery store. However, pantry clients pay nothing, and have access to the full scope of wraparound services, including employment and financial coaching, emergency financial assistance and much more. The truck, donated by a group of individuals, now makes its way to organizations and synagogues that hold food drives throughout the year. In addition, Costco, Target, Walmart and many restaurants are expanding the amount of provisions to the community. The JFS Food Pantry provides meats, dairy, frozen foods and fresh produce, all from local sources, as much as possible. Kosher products are available, and in the next weeks, items for those celebrating Passover are on the shelves. “I started volunteering at JFS to meet my required mitzvah hours for school but I quickly learned to respect the many ways everyone there helps so many thousands of people and I wanted to be a part of that,” said Yavneh Academy senior, Jonah Schwarz-Mullins, the son of Janice Schwarz and Ed Mullins. Schwarz-Mullins, who was honored in February as one of JFS’ Kids with Heart Volunteer, spearheaded an artfest, which raised more than $6,000 for the truck. While he himself is not an artist, many of Schwarz-Mullins’ family members are. He collected donations from them, other artists, and others willing to donate the art from their homes. The artfest took place on June 26, 2018, at the JFS Food Pantry, so donors could see firsthand where their support was going. Meanhile, the truck’s driver is supported by David Goldberg, Randy Fleisher and their families. For more than a year, after volunteering in the food pantry, Goldberg noticed there was little to no fresh produce available. He would buy and deliver hundreds of dollars’ worth of onions, potatoes, apples or oranges. The food pantry is open, by appointment only, from 9 a.m. to 1 p.m. on Tuesdays, Thursdays and Fridays. 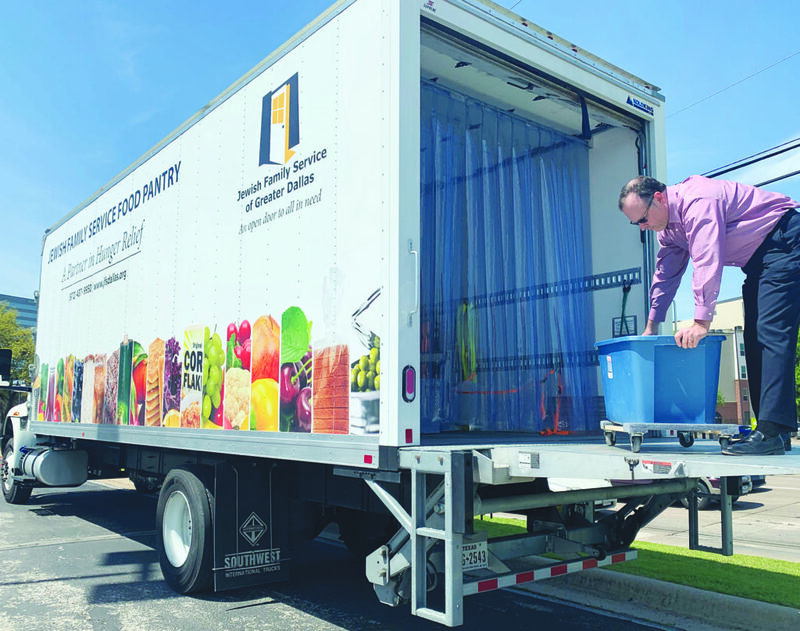 Those wanting to donate dry and canned goods, meat, fresh produce and other perishables can deliver to JFS from 1 p.m. to 5 p.m. Tuesdays-Fridays and from 9 a.m. to 5 p.m. on Mondays. For more information, to donate or to make an appointment, call 972-437-9950.